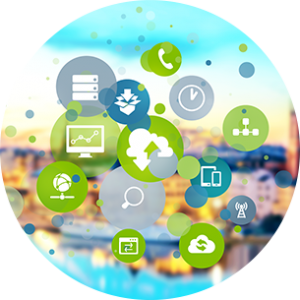 Infopulse offers our customers a completely new qualitative approach to delivering services. Focused on the customer’s business strategy, needs and success, the DevOps Implementation Service increases overall efficiency and agility by accelerating solutions delivery, improving quality, and delivering services at the speed of business – directly to the users. DevOps methodology helps us streamline the whole working process, making it transparent and understandable for the customer, as well as for the involved teams and project stakeholders. Shared responsibility, common tools, processes, and culture unite the team and establish an effective interaction and efficient collaboration between all the members of Development team, IT Operations, Quality Assurance, Managers, and Business representatives, simplifying approval and coordination stages. A more cohesive working environment results in a more coherent software architecture and the higher overall quality of the software code and delivered solutions. 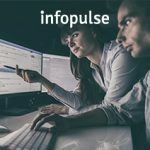 By effectively combining DevOps with Agile and related practices, such as Continuous Integration and Continuous Deployment, Infopulse establishes effective development environment, enabling increased team productivity as well as an automated and faster process of product release. From the project management side, integration of such tools as Azure, Visual Studio, Power BI and TFS along with implementation of DevOps model, facilitates managers’ tasks such as overseeing the roles of each involved member, the current state of the project, and the overall progress. 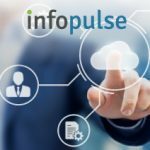 Being a Microsoft Gold Cloud Partner with a deep expertise in Microsoft technology stack, Infopulse is on the edge of modern cloud technology. By combining DevOps methodologies with the cloud technologies, we offer premium cloud solutions and services. Cloud-based DevOps Services enable us to achieve a greatly improved latency of software development while taking the most from the cloud transformative technologies. 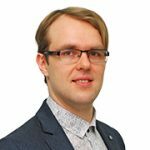 Cloud DevOps service by Infopulse helps businesses achieve smooth, safe and successful digital transformation, eliminating human errors, lowering costs, and streamlining development processes. Security DevOps (DevSecOps) approach ensures efficient and secure software delivery within DevOps model. By integrating application security with DevOps Service, we can achieve high results at application development and secure your software by adopting application security self-testing, self-diagnosing, and self-protection technologies. 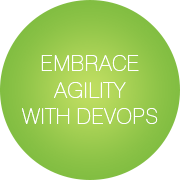 The security team can be engaged at all stages of DevOps lifecycle. E.g., we can perform a thorough security testing and source code review after finishing separate system features at the stage of secure architecture and design. DevOps transforms regular software testing by making it a completely automated acceptance process, minimizing risks and costs and accelerating software development. By adopting DevQAOps and Continuous Testing, we can initiate a new release installation and verification simultaneously in a few clicks, delivering newer software versions at the speed of business. Want to enforce your Application Development Lifecycle with DevOps best practices? Let’s talk.